What is phonological awareness anyway? The concept can be confusing for parents and educators alike. Think of phonological awareness -- understanding that speech and the sounds of language can be broken into smaller units (words, syllables, onsets and rimes, and phonemes) -- as the starting point. Phonemic awareness (understanding that oral language can be divided into smaller components and manipulated) and phonics (the understanding of how letters or spelling patterns represent speech sounds) branch from there. Dr. Sally Shaywitz, a Yale neuroscientist and a specialist in dyslexia, states in "Learning About Learning to Read" that 90 percent of struggling readers have phonological weakness. With such prevalence, every classroom must address it. Recently, Dr. Cindy Cupp, a veteran teacher, former director of Georgia's state Reading and Curriculum Division, and current publisher of a K-1 beginning reading program, discussed this important concept with me in the following conversation. Q: Is phonological awareness essential for all children to become strong readers? A: In 35 years of experience teaching, I find that 80-90 percent of children do better with a strong phonological awareness base including phonics. With such high numbers, it makes sense to teach those skills in every class. If you find students who don't need it, differentiate their instruction. Q: How can we help a child with weak phonological skills? In Kindergarten and first grade, phonological awareness is all about sound and auditory skills. Tapping into the sound delineation is the best place to start. You also can begin working on a separate track with sounds and letters alongside the auditory. Children at this age need a daily dose. When they learn to blend sounds, the two tracks come together. For second grade and up, it's no different. Think about learning to play the piano; whether we learn at five or fifty-five, we still need the foundation. It's the same with reading. Do you have a reading strategy to share? Click here to post it to the Education World Reading forum. For any age, games and word play are important. The teacher's goal is to move them to a level of automaticity, not just a skeletal grasp of skills. Pace your teaching to that level of learning using a systematic, sequential approach, and give students enough exposure to acquire that solid base. Q: Is other support necessary? A: If a child has weak phonological skills by 2nd grade, something caused it. Attitude and emotions are essential at this point, even for children without learning disabilities. Find the child's passion and get parents involved. 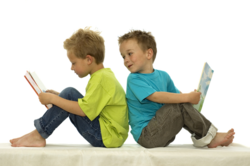 Have children dictate text to create books about their favorite subject. Adjust the vocabulary to match their reading level. Then let them practice reading that book at home and at school. Go back to the piano analogy. We need motivation to keep practicing -- what song would I like to be able to play? Ask the child, "What book do you want to be able to read?" and help them see how practice with specific skills will get them to that point. As a teacher, keep asking yourself, "Where will they find joy in text?" and then find that text. You can learn more about Dr. Cupp by reading her Resume. * phonological awareness: the understanding that speech and the sounds of language can be broken into smaller units (words, syllables, onsets and rimes, and phonemes). * phonemic awareness: the understanding that oral language can be divided into smaller components and manipulated. * phonics: the understanding of how letters or spelling patterns represent speech sounds. When I visit classrooms as the Literacy Ambassador, I introduce poetry to teach phonological awareness. Poems are easier than prose. They are shorter, with plenty of white space on the page. They usually include one phrase per line and often use simple vocabulary. Once a student reads a poem successfully, he or she is motivated to read more, eventually moving to stories and longer texts. You're off and away! . . .
First, read the poem with enthusiasm and flair. Then pose a question, "What do you notice about the sounds in this poem?" Pull the rhyming words out and chart them into word families. Ask the children to add more rhyming words to the list. Manipulate the onset and rime to create new words (real and imaginary). Search for words with the same sound and create tongue twisters together. Have fun! Let students create extensions or new versions of the poem with those words. If children aren't readers yet, they can do this orally. Move older students from phonological awareness activities into a content study of the poem. KKnown as the "Literacy Ambassador," Cathy Puett Miller uses her library science degree from Florida State University as the foundation of her work. With more than ten years experience as an independent literacy consultant working with teachers, parents, librarians, and non-profit family-friendly organizations, she has conducted research initiatives and best practice studies in the areas of beginning reading instruction, emergent literacy and volunteer tutoring. She currently is listed on the U.S. Department of Education's What Works Clearinghouse Registry of Outcome Evaluators. Cathy lives with her husband, Chuck, eighteen-year-old son, Charlie, and lots of friendly, ferociously read books in Huntsville, Alabama. Visit Cathy's Web site at The Literacy Ambassador.